Tropical cyclones (hurricanes and typhoons) may be a trigger for earthquakes, say researchers at the University of Miami. After finding a pattern between large tropical storms in Haiti and Taiwan and earthquakes which occurred there soon afterwards, the researchers claim that the link is causal. “Very wet rain events are the trigger. The heavy rain induces thousands of landslides and severe erosion, which removes ground material from the Earth’s surface, releasing the stress load and encouraging movement along faults,” spoke University of Miami associate professor of marine geology and geophysics, Shimon Wdowinski. “The relations we found are between very wet cyclones and three devastating earthquakes and additional nine earthquakes with magnitude M>5,” Wdowinski told vagabondjourney.com. Wdowinski and a colleague observed that three cyclones — Typhoons Morakot, Herb and Flossie — which hit Taiwan over the past 50 years, may have promoted various magnitude 6+ earthquakes which occurred in the country’s highlands within four years of each tropical deluge. 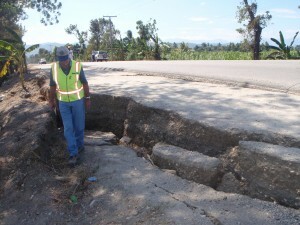 The researchers also uncovered a link between the 2010 magnitude 7 earthquake in the mountains of Haiti and two back to back tropical storms which poured massive amounts of rain on the island just a year and a half before. This research indicates that landslides and erosion from excessive amounts of rain can lessen the weight of the earth over fault lines, which subsequently allows fractures in the bedrock to shift more easily. “The reduced load unclamp the faults, which can promote an earthquake,” said Wdowinski. As the patterns of the natural world continue being decoded, the ability to forecast and prepare for natural disasters improves. But the time frame for forecasting the cause and effect relationship between massive tropical storms and the highland earthquakes they have the potential to induce is still vast in terms of human perception. Within four years was the temporal time span that the researchers found between the two events. In point, Professor Wdowinski’s findings present no reason to ever cancel your travel plans. Someday they’re gonna have a way to know when and where earthquakes are going to hit. Isn’t this what people have been trying to do since the time of the ancient Chinese? Speaking of earthquakes, you missed a rockin’ one here in Mexico City. Pretty freaky, but also strangely thrilling. Whoa, what was the damage like? Not much, surprisingly, at least nothing that I’ve seen so far. It was 6.5 here in the city. Apparently a couple people died down in Guerrero. That’s wild. Is everyone scared that another earthquake is going to hit soon? Nah, I don’t think so. I think people were expecting an earthquake like that, since they happen every 2-3 years or something. In fact, it’s supposed to be good to have moderate earthquakes like the one we had from time to time, because that way there’s not a bunch of pressure building up. Wow, that ground under DF is some pretty scary stuff — sinking aquifers, earthquakes, oh my — though I have to say I miss that city.